The Teen Career Connection is a Summer Youth Internship which gives teens ages 14-18 years old an opportunity to work in a professional setting over the summer. The program lasts for 8 weeks. Participants will be given job training skills, leadership development support, and a career mentor. In Pursuit Youth Ministry (IPYM) will be hosting the Queens forum for “Teen Career Connection” where teens can fill out the applications and submit them for employment. This is a great opportunity please make sure you get your applications in early! Comments Off on Sage’s Rage: Winning Counts! Despite their loss to Stanford University last night, I am soo proud of what the St. John’s University women’s basketball team has accomplished! The Red Storm team finished seventh in the BIG EAST with a 9-7 record and had its second-consecutive 20-win season. They are true champions given their hard work, discipline and winning spirit! Comments Off on Hot off the Press: Can’t stop the storm! After defeating No. 8 seeded Texas Tech, 55-50, on Saturday, No. 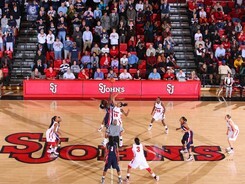 9 seed St. John’s University Women’s basketball team advanced to its second-straight Second Round Appearance in the NCAA Championships. The Red Storm will meet the No. 1 seeded Stanford Cardinals tonight (Monday March 21st) 9:30 p.m. (ET) on ESPN2. today is National Women and Girls HIV/AIDS Awareness Day. you may be rolling your eyes wondering why we need a special day for something people should already know. it seems like the message is out there and everyone is informed. but my travels speaking with girls/young women have lead me to understand that folks are aware but don’t know the facts. one often forgotten fact is that HIV/AIDS is still a major issue in the US. this is especially true for girls/young women. a lot of this has to do with how our bodies are made but it’s also because many of us are not making empowered choices about how we allow our bodies to be treated. saying yes when you know you don’t really want to do it. not asking questions about your partner when you have a naggin’ feeling they are cheating. putting away the condom because you’re afraid what they will think of you. we’ve all experienced how uncomfortable it may be to speak up but your health depends on it! as Chair of the Committee of Psychology and AIDS for the American Psychological Association, it pains me to see the facts and know a lot of girls/women don’t realize their risk. we need to be very alarmed that in 2009, nearly 25% of the new diagnoses of HIV infection in the US were among women and girls aged 13 years and older. women and girls of color—especially black women and girls—are most impacted. in 2009, new diagnoses of HIV infection for black females was nearly 20Xs as high as the rate for white females! yes you read that right, 20Xs higher for black girls/women. all of this is preventable…so do your part and get tested. it’s not enough to get tested once and fall into the illusion that you are safe. if you are sexually active, you need to get tested for HIV and other Sexually Transmitted Infections regularly. you need to protect yourself with each partner or choose to abstain from all sexual activity. spread the word and encourage others to do the same. To find an HIV testing location near you, go to www.hivtest.org or text your ZIP Code to KNOW IT (566948).